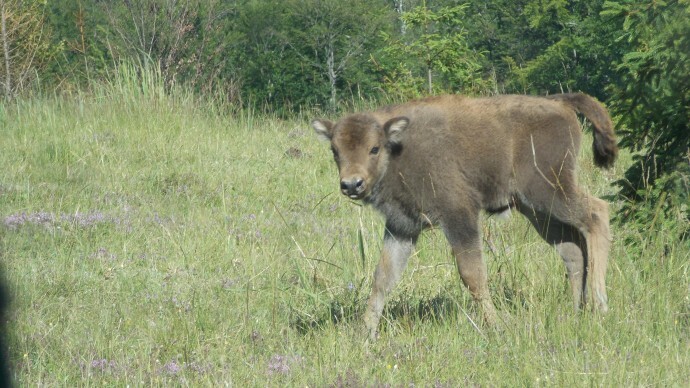 We just learned that the first little newborn bison calf in the Southern Carpathians has died, death probably caused by a horn. Unexpected and very sad news indeed. The first newborn of the Plopu bison herd, Southern Carpathains rewilding area, Romania. The first autopsy results show that the calf suffered a trauma caused by a horn. Things like that happen in nature. The little calf showed all positive signs of being a normally healthy and active animal, before this tragic accident happened, of which noone really know the details. Maybe, the little calf had bad luck, being in the wrong place at the wrong moment? During the very first days after birth, the mother usually keeps her new calf separated from the herd. Then they both rejoin the herd, when the calf is well on his feet and able to keep up with the herd. Normally, that happens in a few days. Maybe the cow and the little one got too close to two animals who where ‘fighting’? Wildlife reintroduction projects all over Europe experience ups and downs, meant to learn from. Although this loss of a calf was a clear ”down”, our team is still very positive and confident about the success of the continued bison reintroduction here. Rewilding Europe, in cooperation with WWF Romania and the local community of Armenis have a long term dedication to building up a viable bison population here in the Tarcu Mountains. Later this year, a new transportation of bison are expected to come here.